Oh what a beautiful morning, oh what a beautiful day! It could well be time to dust the old barbeques off! A bit of warmer weather has arrived & people seem to be a lot happier when there is a bit of sunshine around! Spring has sprung which means Easter will soon be here too. Good Friday is the 22nd April this year, with Easter Sunday on the 24th & Easter Monday the 25th April. Easter is one of our favourites times at BasketsGalore, as it goes hand-in-hand with baskets. They remind me of Easter picnics & Easter Egg hunts! Easter baskets are also a great gift idea. 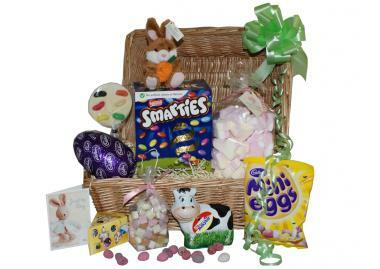 For Easter 2011 we have introduced lots of new Easter gift baskets, some for children (or big kids!) and some for the whole family to enjoy! As well as Easter Eggs, chocolates, lollipops and sweets you might find the Easter bunny himself! The goody basket is decorated in pretty ribbons & is then ready to be unwrapped by the lucky recipient! In our Family Easter baskets you will also find all these things, but with the addition of freshly baked cakes, flapjacks, muffins and cupcakes! You can reserve your Easter gift basket by ordering now & picking a delivery date just before Easter. Couriers won't be delivering on the public holidays, so we advise picking a delivery day a few days in advance. In Ireland the couriers tend to work on Good Friday & then take Easter Monday & Tuesday off. Whereas in the UK they tend to take Good Friday & Easter Monday off, but work on Easter Tuesday. Your gift arriving a bit early will help mums & dads to keep the kids entertained on the school holidays anyway sure! If you think the kids may be all chocolated out, then maybe a children's activity gift basket would be more suitable. For the grown-ups simply take your pick of the many gorgeous gift hampers on offer!